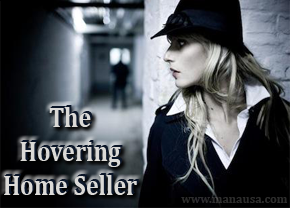 There is nothing so annoying to a homebuyer than a hovering home seller. And save for poor marketing and improper pricing, nothing will keep your home from selling more than being that homeowner who won't give a moment of privacy to the people and real estate agent showing your home. The first thing I would tell a hovering home seller is that you are destroying the home selling process. People do not show up at your home and just buy it (most of the time), they have to go through a process of combining the things they like about it with the compromises they have to make about the things that are not perfect for them. But when you won't give them privacy, most people are far too polite to point out the things they do not love about your home. As a hovering home seller, you stop them from sharing their negative thoughts with the real estate agent, therefore the agent cannot help them determine how they can still buy your home despite it not being exactly what they seek. A hovering home seller creates an environment where buyers just want to leave the house as soon as possible, and that is not conducive to the home selling process. Remember, if you want to get top dollar when you sell a home, you want to do everything and anything possible to create the largest pool of buyers to see the home. Ensure that you're not a hovering home seller, and take the time to study our Definitive Guide For Selling A Home Today.